Carrie's completely crazy about Antonio, her Italian boyfriend. He's incredibly cute, smart, and sweet—everything she's ever wanted. So what's the problem? He hates American girls. And he has no idea that she is one. Antonio despises American tourists. To him, they are superficial, ignorant customers at the restaurant where he works to bring home income for his three younger sisters and his mother. From Antonio's point of view, I guess I can see how we Americans might come across as annoying complainers, but his hatred for all U.S. citizens really got on my nerves sometimes. Thankfully, Carrie had a plan to change that. Carrie was probably my favorite of the three protagonists in this series. Although she was untruthful when it came to hiding her nationality from Antonio, she still seemed the most down to earth. I also loved how she embraced the culture in Rome with so much enthusiasm. Antonio's relationship with Carrie was so cute! 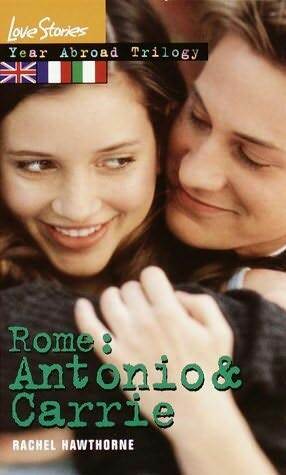 Although he isn't shy when it comes to his feelings about American girls, Antonio has had very little experience in the field of dating. It was adorable to watch him try to get to know Carrie. Aside from the fact that Antonio did not know Carrie was American, their relationship was very honest and true. Overall, I'd say that Carrie and Antonio's story was written more romantically than both of the prequels. I enjoyed both the characters and plot much more, simply because they were more emotional and gripping. If you enjoyed the first two books, then you'll definitely want to look into this one.